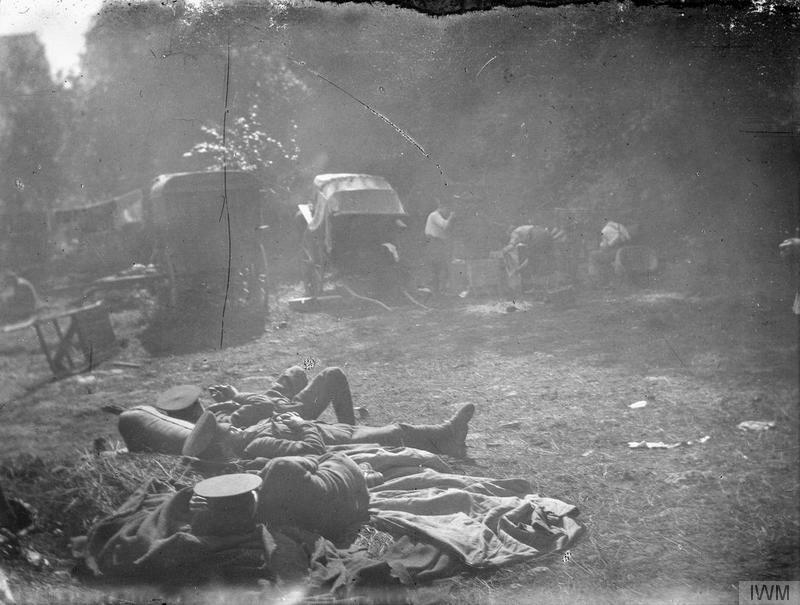 12 – 15 September 1914: the Battle of the Aisne. The advance northwards from the Marne is halted as the Germans dig in along the heights above the River Aisne. 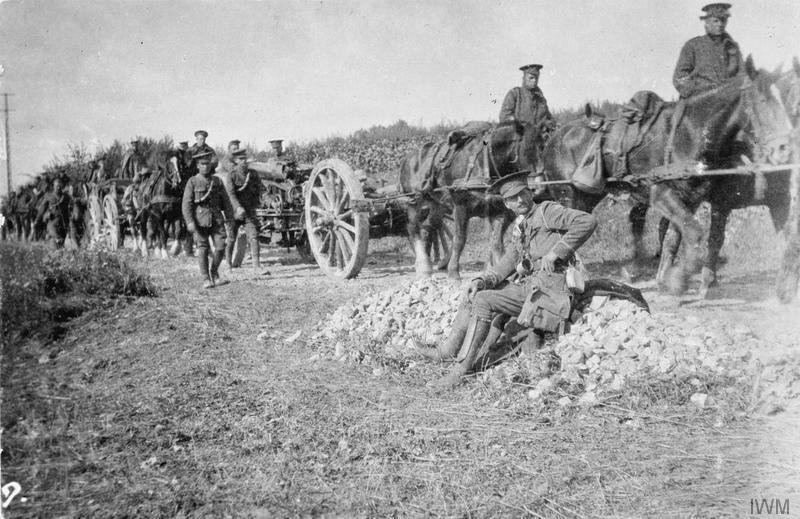 British attacks are repelled and both sides dig in: for the British, the Aisne was the root of trench warfare. On 13 September 1914 the lead elements of the British Expeditionary Force made an opposed crossing of the River Aisne (and the Aisne canal which joins it at an angle), and reached the lower slopes below the German forces now digging in along the Chemin des Dames ridge. Extracts from the personal diary of Captain C. J. Paterson of the 1st South Wales Borderers (3rd Infantry Brigade, 1st Division, I Corps). Paterson’s diary is, rather unusually, included with the battalion’s war diary and covers the period in September 1914 as the battalion advanced from the Marne to the slopes above the Aisne. The horrors of attacking up the slopes of folds towards the Chemin des Dames ridge and then of determined German counter attacks typifies the Aisne of 1914. [Lieutenant Homfray was killed in action near Ypres on 11th November 1914 and is buried in Sanctuary Wood Cemetery]. Also from British Official History. 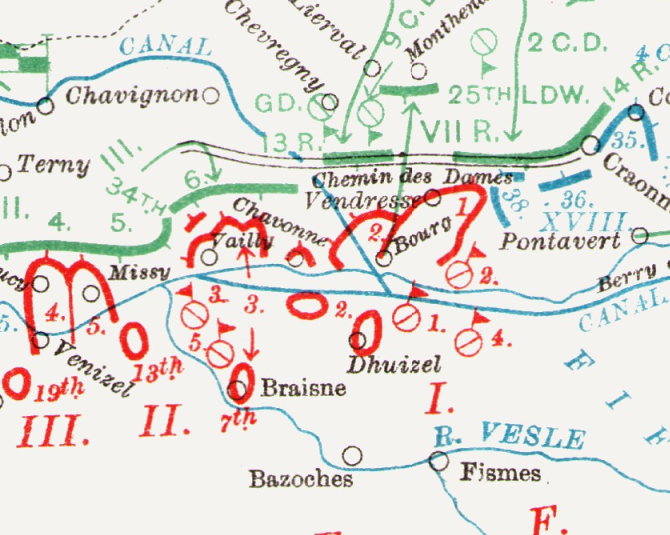 The position of 1st Division during the Battle of the Aisne. 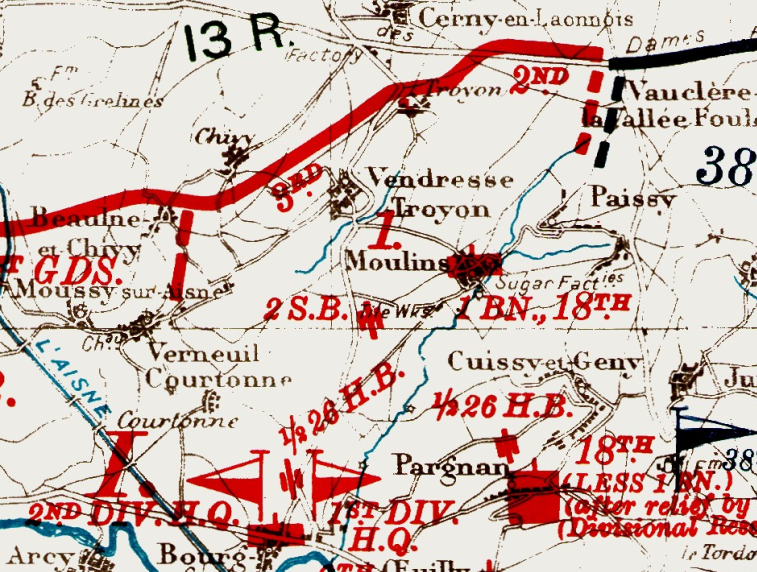 It held the line from the Chemin des Dames east of Cerny (with the French on the right) down past Vendresse to Beaulne. The 3rd Infantry Brigade, which included the 1st South Wales Borderers, was on its left front. “I have never spent and imagine that I can never spend a more ghastly and heart-tearing 48 hours than the last. Not a moment in which to write a word in my diary. We have been fighting hard ever since 8am on the 14th and have suffered much. At about 6am at Moulins we hear a good deal of firing going on and shells begin dropping about. We are then on the road moving north. The Queen’s have been re-directed to the north-east some little time before and we are head of the Brigade. The 2nd Brigade is already engaged and we are sent to the high ground to the left to assist them. As we go we get some six shrapnels at us but mercifully are not touched. We reached the shelter of the high ground which rises quickly and steeply from the plain and then we advance over the crest and take up our position in a wood, ready to move out when required. Shrapnel and rifle fire fairly heavy. The first casualty is my mare who was shot in the head. Nothing very bad at present and she is able to go on carrying my stuff. Though I do not ride her. The General and Staff and CO and I watched the fight in the neighbouring valley in front. It is a high ridge opposite, i.e west of us, that we have got to go for and nasty work it will be. Jenkinson, the Brigade Major, is killed, poor fellow, and soon afterwards we begin to suffer in the wood, chiefly from ricochets. We get several men down with small wounds, and then as C Company goes to attack, Lieutenant M T Johnson of A shot through the body. We hope he is not mortally wounded, but feared he is. C, D, and A Companies go out, leaving B in support. Swarms of the Germans on the ridge, rather massed. Our guns opened on them at 1800 yards, and one can see a nasty sight through one’s glasses. Bunches of Germans blown to pieces. At dusk we are ordered to move up the valley towards the T of Troyon, which we did. As D Company was leading the wood a melanite shell burst at head of 1 Platoon. Poor young Vernon and a few men were knocked out. Vernon mercifully and miraculously not killed. On we go. It is now too late to be fired at by rifle fire and we go on well, but in the dark C and A Companies go ahead, and D lost touch. Most annoying. On reaching the ridge at the head of the valley we find only B and D companies, and as we were looking for the others, shots rang out and we were soon at it again. Short and sharp. Germans withdrew. “The most ghastly day of my life and yet to one of the proudest because my Regiment did its job and held on against heavy odds. At 4.15am Germans attacked. Main attack apparently against my regiment, which is the left of our line. D and A Companies in the trenches. B and C hustled up to support, and soon the whole place alive with bullets. News comes that they are trying to work round our left. The CO asked the Welsh Regiment to deal with this, which it did. Poor D Company had to face the music more than anyone else. Presently the news comes that the Germans are in a quarry in the middle of our line, i.e that our line was pierced. C Company drove them clean out. About 3pm, things began to quieten down, D and A companies had done their share of the work on the right and left. We were able to reorganise more or less, except for D Company’s far advanced trenches, and those we searched at night and found James wounded, Sills and Welby killed. Total casualties. Killed Welby, Simonds, Coker, Sills and 86 men; wounded – Pritchard, James and Gwynn slightly, and 95 men; and missing 12. These 12 were of D Company, and apparently surrendered. May they be spared to reach England again and be tried by court martial and get what they deserve. Never has the 24th surrendered yet, and in spite of casualties the rest of the Regiment stuck to it and fought as Englishman and 24th men could fight. Second Lieutenant Charles Caldwell Sills, 20, has no known grave and is commemorated on the Memorial to the Missing at La Ferté-sous-Jouarre. He joined the regiment after graduating from Sandhurst in September 1913. 41 year-old Major Glynn Everard Earle Welby, officer commanding D Company, had been serving with the regiment since December 1893, and had seen service in the war in South Africa. He has no known grave and is also commemorated at La Ferté. Lieutenant George Prescott Blackall-Simonds, Reserve of Officers, attached SWB. Saw service in South African War as a railway staff officer. He als has no known grave. Aged 33. Second Lieutenant John Cadwallader Coker, 27, is buried in Vendresse British Cemetery. He joined the regiment in August 1908. 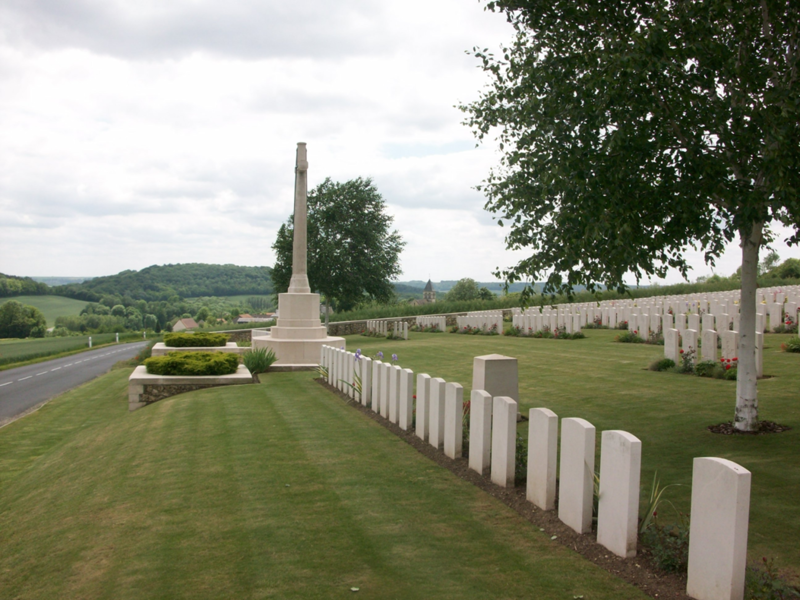 A view of Vendresse British Cemetery, looking down the slope towards the River Aisne. Vendresse church tower can be seen behind the cemetery. The wooded slopes make the Aisne today a pretty, gentle area that belies the horrors it witnesses in the Great War.